← iPad sales vs. Mac portable sales. Wow. The clipping above (h/t to neighbor KW) is from the NY Times. I'd responded online to an article about the challenges of family travel, and they asked me for permission to include my response in the print edition. I didn't even know there was a print edition any more. Okay kidding about that last bit. But I was pleased that they liked the comment. Note that they did edit my original comment. I'd originally written that second sentence as simply “Sad though it may be that it's come to this, the iPad has…” They also removed iPadAlone.com from my signature! 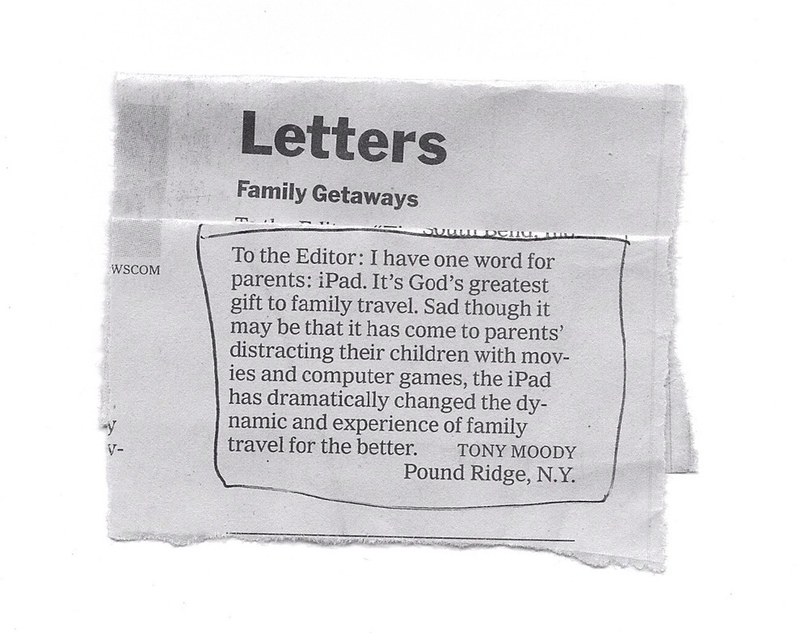 This entry was posted in Fun, Musings and tagged Fun, iOS iPad as sole only computer, iPad, iPad alone, ipad kids, iPad primary computer, ipad travel. Bookmark the permalink.